Rotherham Magistrates' Court, County Court and Family Court in Rotherham town centre are set to be closed by the end of the year, the Ministry of Justice has confirmed. The Government has been consulting on modernisation plans which aim to reduce the £500m annual cost of the courts estate as the justice system moves towards one "that must be accessible through online services as well as traditional court buildings." Opened in 1994, the building by the canal and Police Station on Main Street, has now been dubbed "poor quality." It has ten courtrooms, two county court district judge chambers, 11 cells with secure access to eight courtrooms and interview rooms available for private consultation. The closure has now been confirmed with proposals for criminal work to be transferred to Sheffield Magistrates' Court and the county court work transferred to Sheffield County Court. The move would create a "improved and more efficient service" that "would enable the workload to be moved to larger court centres and will allow the court to be responsive and flexible with the throughput and listing of cases meeting customer and workflow demands more effectively." 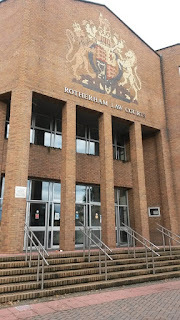 18 members of staff are based at the Rotherham buildings, where operating costs were £640,000 for the 2014/15 financial year and utilisation at the court was approximately 32% of its capacity. The Law Society disagreed with the proposals to close the Rotherham site listing the impact on organisations that have rooms there such as the National Probation Service and the Citizens Advice Bureau. The increase in travel times and costs for court users was also raised in consultation. 86 of the original 91 courts identified last year will close. Shailesh Vara, Parliamentary Under-Secretary of State for Justice, Minister for the Courts and Legal Aid, said: "Court closures are difficult decisions; local communities have strong allegiances to their local courts and I understand their concerns. But changes to the estate are vital if we are to modernise a system which everybody accepts is unwieldy, inefficient, slow, expensive to maintain and unduly bureaucratic. "Closing these courts in poor quality buildings will raise £40m to re-invest in the justice system, and save hard-working taxpayers £27m per year." Rotherham's three MPs, John Healey, Kevin Barron and Sarah Champion, wrote to the Justice Secretary objecting to plans. Commenting yesterday, they said: "We managed to fight off similar plans four years ago, so it was frustrating and disappointing to see the proposals come back last year. "The government have been determined to press ahead with their plans, ignoring strong concerns raised by us and local magistrates. "Closing the Rotherham court is deeply wrong and a huge blow to the delivery of justice locally. "The court is one of the most visible symbols of justice in our town and removing it could further undermine confidence in the justice system, which has already been badly shaken in recent years." Cllr. Chris Read, leader of Rotherham Council urged the Government to think again during the consultation. He said: "This is an important building within our town centre - the regeneration of which has been praised by Mary Portas - and the prospect of it standing empty for any length of time is a concern in and of itself. However, the loss of the service and the principle of local justice goes way beyond this. "We would lose the principle of magistrates with detailed local knowledge that has always underpinned the magistrates' service in England." Rotherham's court is expected to close between October and December this year. Consultation with the departmental trade unions on staffing impacts will take place over the coming months.